Perhaps your doctor has told you about natural thyroid hormone replacement therapy. Armour Thyroid is one example of this type of hormone replacement therapy but is currently not available from Forrest Pharmaceuticals in the USA. 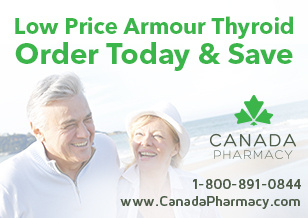 Armour Thyroid is available from Canada but is known as “Thyroid”. It is manufactured by Erfa and tested and approved for sale by Health Canada. Thyroid is therapeutically equivalent to Armour Thyroid. Thyroid is a natural product made from Porcine desiccated thyroid gland and has no synthetic ingredients. It provides both the key thyroid hormones [levothyroxine (T4) and L-triiodothyronine (T3)]. Whether you are beginning treatment for hypothyroidism or switching from another product, the following information about Thyroid will be helpful. This site is intended to give you the information necessary to care for yourselves in the most natural and healthy way! Thyroid is a hormone preparation made from desiccated pig thyroid glands. The inactive ingredients are cornstarch, magnesium stearate, sugar and talc. It does not contain any Gluten, Paraben, Sulfite or Tartrazine. Thyroid is primarily used for specific replacement therapy for decreased or absent thyroid function. Some Hypothyroid symptoms include lack of energy, weight gain, hair loss or dry skin. Thyroid increases T3 and T4 levels and it affects the growth, development and metabolism of all tissues. Most individuals may want to know if Thyroid is suitable for them. Individuals should not use Thyrod is they have uncorrected adrenal insufficiency or untreated thyrotoxicosis. Also, if you have any hypersensitivity to any of the active or extraneous constituents, so not use Thyroid. Thyroid is available in 3 dosage forms: 30mg, 60mg and 125mg (1/2 grain, 1 grain and 2 grains). Most thyroid hormone medications are taken once daily, usually in the morning. If you miss a dose of your thyroid hormone medication, take it as soon as possible. If it is almost time for the next dose, do not take the dose you forgot, just continue with your regular schedule; never take a double dose. Take Thyroid hormone tablets by mouth 30minutes before a meal (on an empty stomach) with a full glass of water. The doses should be taken at regular intervals as indicated on the medication label. Do not take your medication more often than directed. Call your doctor if you miss two or more doses. Start saving today! Buy Armour Thyroid Online from Canada Pharmacy.